Squirt is a carbonated grapefruit drink created by Herb Bishop in 1938. Bishop’s intention was to make a soft drink that required less fruit and sugar than other sodas, due to the Great Depression. He started with a soft drink by the name of Citrus Club that was bottled in Phoenix, Arizona (which was quite popular in that part of the country). Bishop’s experimentation resulted in a soft drink made from grapefruit juice and sugar that he believed to be the freshest tasting soft drink available on the market. He thought it tasted like a slice of grapefruit exploding in the mouth, so he called it “Squirt”. In 1941, Bishop and his partner, Ed Mehren, created a character called “Little Squirt” to use in the marketing of their soft drink. The little tike encouraged people to “Drink Squirt”. He caught on right away with the consumers and sales increased. The soft drink did well through WWII, because of its reduced sugar content, and in the 1950s, Squirt became a popular drink mixer. 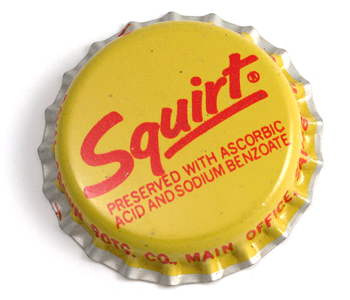 By the mid-1970s, Squirt was sold in Central and South America. In 1977, Squirt was bought by a Michigan bottler, Brooks Products, that went on to introduce a new product logo and a reformulated Squirt. Diet Squirt – the first soft drink in the US to use aspartame – was introduced in 1983. Ruby Red and Diet Ruby Red soft drinks were also launched. Today Squirt is the best-selling grapefruit soft drink in the United States. It is one of the many brands under the corporate umbrella of London-based The Cadbury Schweppes Group,which was purchased as part of Dr. Pepper/Seven-Up, Inc. in 2000.